Veronica N. Cuyugan: I'm Engaged!!! 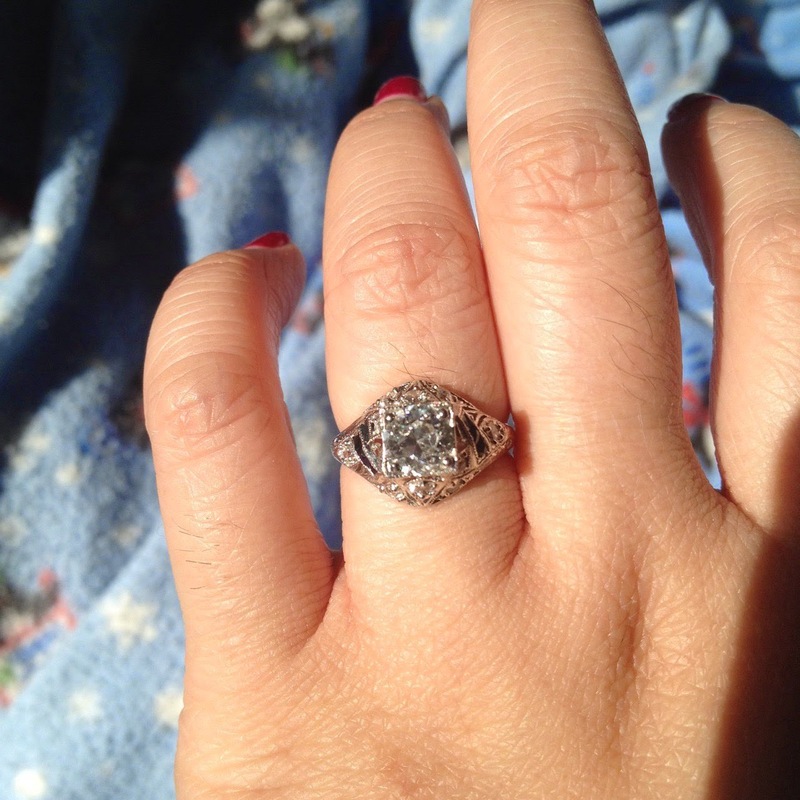 I have to pause for a moment and express my gratitude and love for my husband-to-be, Keith Percy﻿, and talk about my turn of the century, Edwardian style engagement ring. 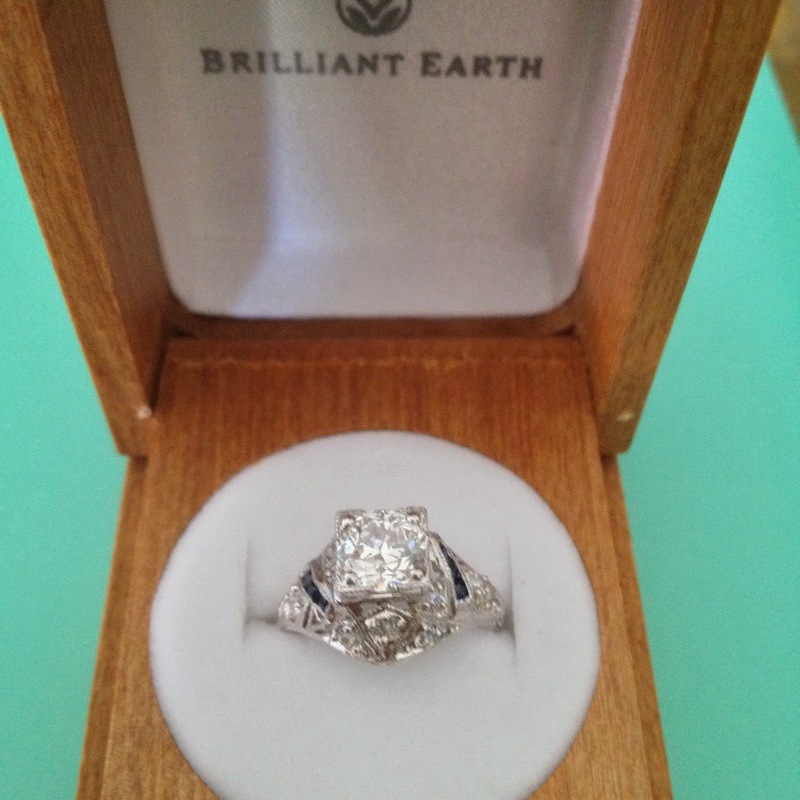 Upon returning home from a 7-hour drive from Orlando, I opened our door to him, on bended knee, surrounded by our three precious fur children, with an open box from Brilliant Earth﻿ with a gorgeous, gleaming ring in it. "Will you marry me, Babe?" were the first words I heard as I perked up from my state of exhaustion. "Of course," I cried, as our little Penelope tinkled her excitement all over my leg. It was picture perfect. Now, about my ring: when I was in college, I had an assignment that entailed researching then giving a speech about the movie Blood Diamond﻿. Watching that messed me up. I was conflicted because I grew up around women who loved to wear gorgeous, one-of-a-kind pieces of jewelry. Although things are not happiness, I do appreciate some bling in my life every once in a while. My research taught me about the Kimberley Process, a way for diamonds to be certified as "conflict-free," meaning no blood was shed over the acquisition of the diamonds. I knew then that if I were ever to purchase diamond jewelry, that I would insist that it was sourced from a retailer who could guarantee the status of the piece. Brilliant Earth sells unique, vintage pieces (such as mine) as well as conflict-free mined/lab-created diamonds and other precious stones. The craftsmanship that is celebrated in the vintage pieces is extremely difficult to find these days, and of course the price is heavily discounted because vintage jewelry is pre-loved. In the case of vintage/antique jewelry, no new mining was necessary for its acquisition. The stunner I now wear on my left ring finger is The Layne Ring. It is a masterpiece set in platinum that was created in the early 1900's. One round, old-mine cut diamond is flanked by 6 asymmetrically set baguette sapphires and the center diamond is aloft 10 other round cut diamonds. Eleven diamonds (it really must be my lucky number). The details look like lace! I have never experienced as much joy as I have experienced this week. I am so deeply grateful for all of the love and support my fiance has blessed me with. I wouldn't be where I am without him. As I embark upon this exciting chapter in my life, I am thrilled by the outpouring of love and support from my family and friends. I thank you all for being such a wonderful part of my journey. Never in a million years did I ever think I would experience a book launch and an engagement within the same week. My eyes are filled with happy tears. Many.many years of happiness for you both. I love a wonderful love story.